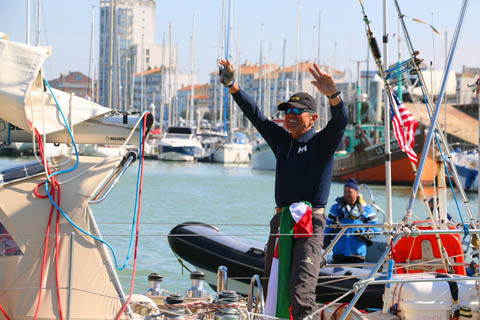 American Hungarian solo yachtsman Istvan Kopar finally reached the finish line off Les Sables d’Olonne, France at 13:58 UTC today to take 4th place in the 2018 Golden Globe Race. The 2018 GGR prize giving in Les Sables d’Olonne is set for April 22 – the day that Sir Robin Knox-Johnston completed the first solo non-stop circumnavigation 50 years before. There will also be opportunities to sail aboard Bernard Moitessier’s famous 1968/9 Golden Globe Race yacht Joshua throughout the weekend from Port Olona on 20/21/22 April,organized by the Friends of the Maritime Museum of La Rochelle. Cover photo: Istvan Kopar and his Tradewind 35 Puffin heading towards the Les Sables d'Olonne finish line today.